Club USA Fitness has 50 brand new Schwinn Blue Carbon bikes with specialized, calibrated computers. Looking for gyms with spin classes near you? Club USA has an indoor cycling class designed for all levels of fitness from the beginner to the elite. Jump start your morning with an invigorating ride in our Sunrise Cycle class. Whether the goal is fitness training, weight loss or an alternative to cold, early morning rides outside, this class will challenge you to find your maximum pace. Get your cardio buzz going with this 75-minute climb, race, and sprint to the “finish-line” cycling class. Extra minutes equals extra endurance, extra calories burned, and extra strength. Get ready to be transformed! For a full breakdown of our spin classes from our outstanding Club USA staff, contact us at membership@clubusa.net. The computers used for our indoor cycling classes have power, gears, RPM (cadence), and heart rate. The teachers are all Schwinn certified and have the knowledge and experience to make sure that everyone gets the workout they desired. All bikes in each spin class are equipped with SPD bike pedal clips on one side, allowing the serious rider comfort & stability, flip the pedal and one will find shoe baskets on the other, allowing a great introduction to the exercise. 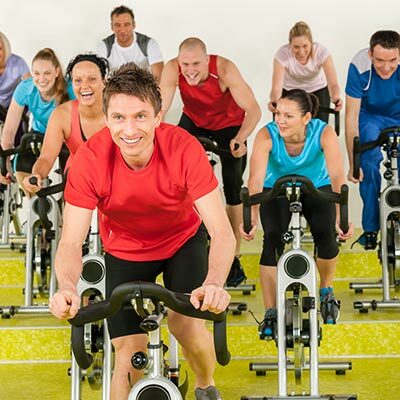 Indoor cycling is a great way to get in your cardio each week. It is a low-impact workout helping you shed fat, improve your heart health, and boost your muscle endurance. Your legs will get a serious workout. Regardless of your fitness level, your heart rate will increase and stay elevated for 45-60 minutes in our indoor cycling classes. There will be brief moments of slower pedaling, but most of the spin class will be steady work. Incorporated into the Indoor Cycling program is MYZONE, a heart rate tracking wearable providing gym members with feedback based on heart rate zones and effort. Although not required, MYZONE allows terrific individual exercise information. MYZONE monitors and trackers are located in the TEAM TRAINING/AEROBIC ROOM, The RED Zone, & the Upstairs Weight Room. Many of our other fitness classes are incorporating the Schwinn spin bikes as well, so check out our schedule! You can stop looking for gyms with spin classes near you, Club USA has the indoor cycling classes you have been looking for. Visit our location or send us an email at membership@clubusa.net to get started.